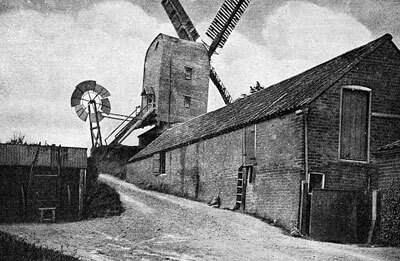 Sprowston postmill, sometimes known as Mousehold Mill, has one of the best documented mill histories in the county and has been the subject of several books. It was built in 1780 as an open trestle mill but a two storey roundhouse was added later. A canopy was over the platform and a tailpole was cut off at the ladder. 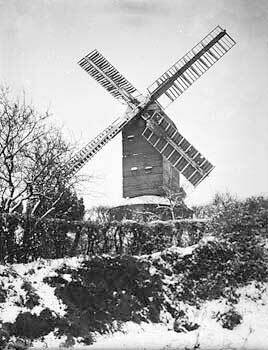 The mill was built with common sails and later converted to patent sails with a 6 bladed fantail on a ladder. The fantail took 625 revolutions to turn the mill through 360º, thus @ 120 r.p.m. it would take 2½ minutes to turn 180º. The 4 double shuttered sails each had 8 bays of 3 shutters, that were struck internally by rack & pinion. The sails powered one pair of 4 ft. 6 ins. and one pair of 4 ft. French burr stones in the head and a further single pair of 3 ft. 6 ins. stones in the tail, thus needing about two tons of grain in the tail to balance the structure. The body had a gable porch. The main post of the mill was 32” square at the base and there was a ball bearing collar resembling a deep groove thrust bearing and 52 cast iron balls, 2¼” in diameter. The sails had an angle of 2 degrees at the top and 27 degrees at the heel, with a span of 63 feet and a width of 8 feet. They were struck by rack & pinion via a chain wheel inside the mill. The great spur wheel was made of iron, cladded with wood on the rim sides and with wooden spokes. An iron bevel rim driving a bevel pinion was bolted to its upper side. The shaft on which the pinion was mounted, passed through a hole in the crown tree and extended to the rear of the mill to drive the small pair of stones in the tail of the mill. The two pairs of stones in the breast of the mill and the single pair in the tail were all underdriven. Alarm bells were operated by damsels. Governors were driven from the upright shaft. 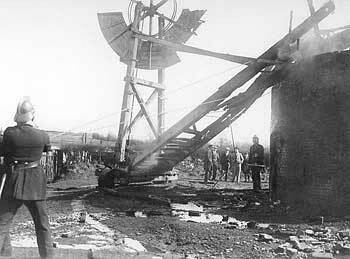 The sack hoist was driven by a cone clutch from the brake wheel. The boulter was driven from the sack hoist drive. It was a standard model and had a six bar reel and six beater bars. A chute from the hopper above had a shaking action by a four-part cam on the boulter shaft. The meal supply was regulated by a metal slide on the hopper, controlled by a two-ball governor through a quarter-twist belt from a pulley on the boulter shaft. Breast and tail beams on a sub-frame in the top of the mill carried the windshaft and the sails. The whole assembly was moved forwards or backwards in relation to the main frame of the mill by means of a screw. This was done if it was found that by reason of wear in the bearings, the sails were just touching the roof of the roundhouse. This procedure was termed "Putting sails out of the house." The post . . . at Sprowston is no less than thirty-two inches square.
. . . journal bearing for steadying purposes . . . at Sprowston Mill it is a ball bearing, with 2¼ inches cast iron balls. This is the earliest example of this class of bearing the author has met, and possibly dates from 1780. At Sprowston, Norwich, is I believe the earliest ball bearing extant. It forms the steady journal in the waist and encircles the post. It is 34 ins. outside diameter and has 42 2¼ cast iron balls. There is no trace of machining anywhere on the bearings or the balls and the accuracy and cleanliness of the castings is remarkable. 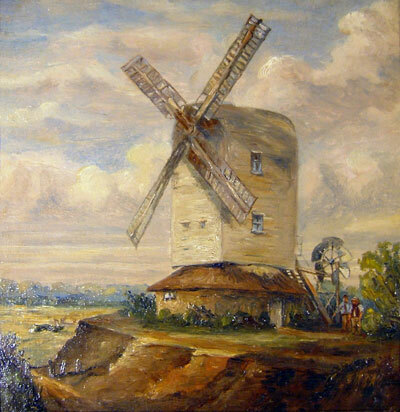 The mill was originally built as an open trestle mill without a roundhouse and in that state was the subject of an etching by John Crome in 1810 that went on to hang in the National Gallery. 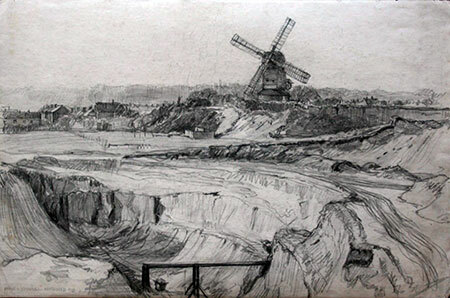 The etching showed Sprowston postmill and Bond's towermill together. The mill was first shown on Faden's map of 1797. Thomas Carlton is given as the miller at Sprowston in the 1817 Poll Book and he advertised the mill for sale in 1823. 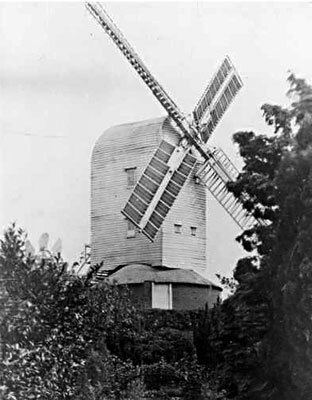 A Good Substantial Post WIND-MILL, able to do from four to five score per Week, in good repair, with two pair of French Stones at the head, Flour Mill and Jumper, with a good Round House with two floors; also a New House with Stables and other conveniences, with one Acre of good Land more or less, all Freehold; situated one mile from Magdalen Gates, Norwich, in the parish of Sprowston. – Enquire of Mr. Carlton on the Premises. – Possession may be had immediately. 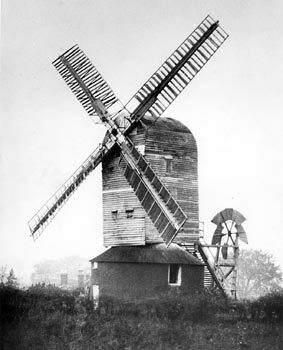 A Capital POST WINDMILL, with two pair of French Stones at the Head, Round-house with two floors, Going Gears and appendages, now in complete order, and capable of grinding from four to five score per week. Also a new built Dwelling-house, Stable, Cart shed &c. and upwards of one acre of excellent Land, including the scites of the mill and buildings, the whole in the possession of Mr. Thomas Carlton, and situate in Sprowston, next the Wroxham Turnpike and about one mile from Magdalen Gates. All freehold, and subject only to 2s. Land-tax. To view the Premises apply to Mr. Carlton, and for price and further particulars to him, or Mr. Cuddon, Conveyancer, Upper Close, Norwich. and late of Thorpe next Norwich, Miller. TO BE LET, with Possession at Michaelmas next, a POST WIND-MILL, in Full Trade, with a convenient Dwelling-house, Stable, Cart Sheds, and Garden, situate on Mousehold, within half a mile of Norwich. – For Rent and other particulars apply to Mr. Roger Kerrison, Solicitor, Norwich. Robert Robertson was the miller by 1824. He had the patent sails and fantail put on the mill. 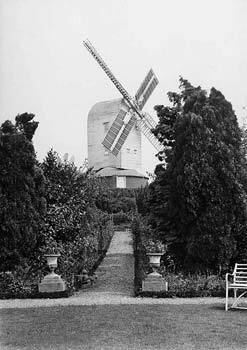 He had married Sarah Rockhill in 1820 and may have been at the Market_Hills post mill in Great Yarmouth from 1820 to 1822. In 1824 a daughter Julianne, was born, then in 1827 another daughter, Susannah and in 1830 a son, George Rockhill. Robert Robinson was listed in Pigot’s Directory of 1830. In 1831 he had another daughter, Hannah Rachel. On the 19th July 1832 there was an accident involving Robert Robinson's horse and cart. We have this week to record another very serious accident arising from a horse running away with a cart. It appears that on Monday evening a valuable mare and cart belonging to Mr. Robinson, miller, of Sprowston, was standing at a baker’s door, in Ber-street, and during the absence of the man, who was collecting empty sacks, the reins became entangled with the tail of the mare, and she set off down Ber-street, along Goldenball-lane, and at full speed down Castle Ditches, as far as the New Shirehall, whence she was met by a poney and gig, in which Mr. J. Muskett, of the Yarmouth Bridge Inn, and Mrs Bailey Bird, relict of the late Mr. Bailey Bird, of Red Lion-street, were returning from a ride. – So frightful and tremendous was the collision that the shaft of the gig entered just beyond the shoulder of the mare, and penetrated the heart, and she fell lifeless on the spot. At the same time Mr. Muskett and Mrs. Bird were thrown out with great violence; they were soon conveyed home, and surgical assistance sent for, when it was found that Mr. Muskett had received a severe fracture on the head, and his body was much bruised, and that Mrs. Bird had one of her arms broken, and was otherwise very seriously injured in the head. The poney was cut across the eye and the gig damaged. We regret to say that Mrs. Bird died yesterday (Friday) noon from the effects of this dreadful accident, and that Mr. Muskett’s death from the same is hourly apprehended. In 1834 Robert Robinson had a son, William Alfred. Saturday night last, some person or persons broke into the mill of Mr. Robertson, of Sprowston, and stole therefrom 25 stone of flour and two sacks. Robert Robertson was listed in Pigot's directory of 1839 and Blyth’s Directory of 1842. He was killed in an accident in the mill on the 8th March 1842. Tuesday last, aged 48, Mr. Robert Robertson, miller, of Sprowston from a fatal accident in his own mill. His loss in all the relations of life as a husband, father, and friend, will be deeply mourned by his bereaved family: and sincerely felt by the neighbourhood in which he lived, where he was a pattern of that pious conversation and upright conduct which true religion alone inspires. An inquest was held on the body or Mr. Robert Robertson, miller, on Tuesday evening, before Mr. Pilgrim, at the Norwich and Norfolk Arms, Sprowston, when the Jury found a verdict of “Accidental Death.” It appears that as the deceased was putting the strap into the bolting mill, he was caught up by the wrist and was drawn up till he stuck fast at the shoulders in the machinery, the body of the unfortunate man stopping the mill, which had been observed to stand still for a quarter of an hour. When found, he was dead. He leaves a widow and six children to lament the catastrophe, which has deprived them of the best of husbands and fathers. The above account of Robert Robertson’s death contradicts the version in H. C. Harrison’s book (written some 100 years later in 1948) that he became entangled in the drive from the brake wheel to the sack hoist. He was buried in Sprowston church. The ownership of the mill then passed to his wife, Sarah Robertson. 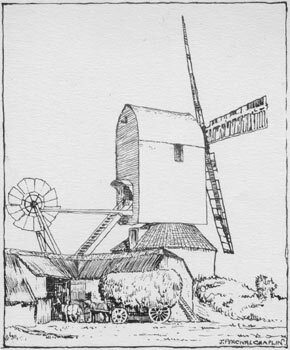 A CAPITAL WINDMILL driving two pairs of STONES, situate near one of the most populous parts of the suburbs of Norwich, and in which a good Trade has been carried on for many years. For Rent and further Particulars apply to Mr. Thomas Rackham, King-street, Norwich. ALL Persons Indebted to the Estate of ROBT. ROBERTSON, late of Sprowston, in the County of Norfolk, Miller, deceased, are requested forthwith to pay their respective Debts either to Mrs. Sarah Robertson, of Sprowston aforesaid, the administatrix of the deceased, or to Mr. Everett Bardwell, Solicitor, St. Andrew’s Street, Norwich, and all persons who have any demands upon the said Estate are requested to send in an account of the same, either to my office as aforesaid, or to the said Sarah Robertson. Returns her grateful Thanks to those Friends of her late Husband, who for many years favoured him with their Support, and she takes this opportunity of acquainting her Friends and the Public, that having engaged a competent person to superintend the Mill, she intends carrying on the Business as usual in all its departments, for the maintenance of Herself and Six children, and earnestly solicits a continuance of those favours enjoyed by her late husband. No. 377 Windmill, House etc. Pasture 0a. 2r. 39p. 2s. 6d. Sarah Robertson & Son were listed as millers at Sprowston in Hunt and Co.’s Directory of 1850. Sarah Robertson was born c.1793 at Pakefield, Suffolk. In 1851, she was given as a miller aged 58 employing one man living in Wroxham Road, Sprowston, with her sons Robert W., 27 and George R, 21, who were both millers. There was a double wedding in the family in 1856. On the 17th inst., at Oulton, Suffolk, by the Rev, F. Fell, Mr. Robert Wm. Robertson, miller, to Miss Elizabeth Goff, second daughter of Mr. Thomas Goff, Farmer, both of the above place, also at the same time and place, Mr. Thomas Goff, eldest son of Mr. Thos. Goff, to Miss Julianna Robertson, second daughter of the late Mr. Robert Robertson, miller, Sprowston, in this county. It would appear that Julianna was widowed within nine years, as she was again married in Oulton Church in 1865. On Thursday last, at Oulton Church, Suffolk, by the Rev. Charles Steward, Mr. Chester Lay, farmer, Barnby to Julianna, second daughter of the late Mr. Robert Robertson, late of Sprowston, in this county. George Rockhill Robertson took over the mill from c.1858. The mill was marked on the 1880 map. In 1881 he was given as living in Sprowston Road, Sprowston with wife Susanna, 54, and son George William. George Rockhill Robertson died in 1884. The mortal remains of the late Mr. G. R. Robertson, miller and Merchant, of Sprowston, Norfolk, were laid to rest on Monday May 5 in the churchyard of that parish, and in the presence of a large assemblage of mourning friends. The deceased gentleman had succeeded his father in the occupation of the Sprowston Mill, and had earned the esteem and regard of his neighbours. Sarah Robertson died in 1884 aged 92. 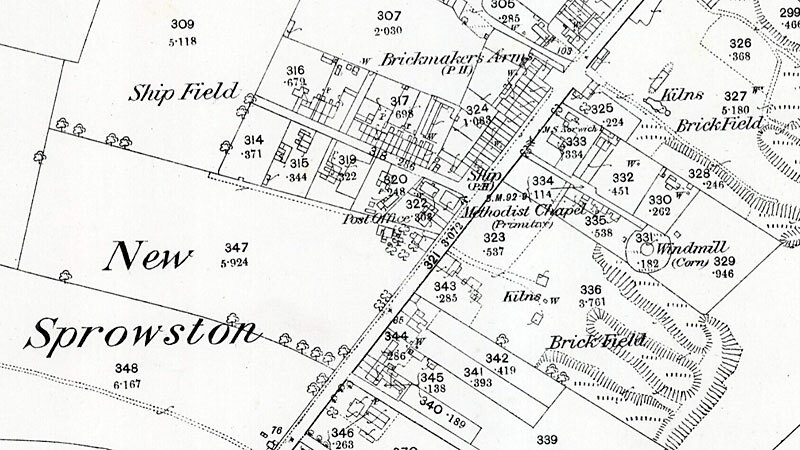 Robertson & Son were listed in White’s Directory of 1888 as corn merchants and millers, 75 Corn Exchange; and Sprowston. William Albert Harrison inherited the mill from George Rockhill Robertson, who was his maternal uncle. It was his mother, Elizabeth Sarah, eldest daughter of Robert Robertson, who had found her father dead in the mill. She died c.1915, aged 95. William Albert Harrison’s wife was Rachel Margaret. In 1885 they had a daughter, Edith Alice; in 1886 they had a son, William Edmund; in 1888 they had a son, Herbert Clifford; in 1891 they had a son, Horace George; in 1893 the had a son, Leonard Linford and in 1897 they had a daughter, Olive Victoria. Elizabeth's sons worked Oulton Broad, Gisleham, Wangford and Sprowston mills. Her oldest son Robert William helped at Sprowston postmill after his father was crushed to death and he later bought a mill at Oulton Broad. Her next son, George, continued the family line at Sprowston and her youngest son, William Alfred, was an apprentice at a Wymondham mill and a journeyman at Great Bentley, Essex and he later owned St Margaret's Church Mill in Lowestoft. Abraham's son William Proctor Robertson worked a mill in Eaton. Horace George Harrison, who followed his father at the mill, used to say that he remembered the great gale of Sunday, 24th March 1895, which rocked the mill. His father turned his back on the mill saying he did not want to see it fall. However, it survived with little damage. In 1920 Horace G. Harrison hired the mill from his father. 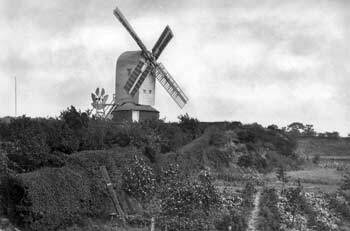 He was listed in Kelly’s Directory of 1924 as a miller (wind) Windmill Road, living at 481 Sprowston Road. By 1928 it was no longer economic to keep the mill working and it reverted to William A. Harrison. In 1933 arrangements had been made to hand the mill over to the Norfolk Archaeological Society for preservation by a Trust, as from 25th March. 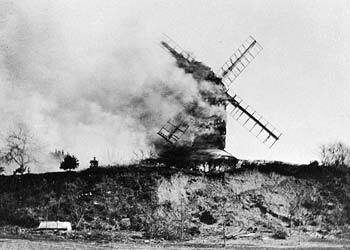 However, on the 23rd March someone lit a rubbish fire at the edge of Mousehold Heath, the gorse caught fire and flaming debris blowing onto the canvas sails soon set the mill alight.
. . . the total destruction by fire on Thursday of the ancient windmill on Mousehold Heath, Sprowston. . . . The fire . . . broke out about eleven o'clock. Smoke was seen rolling past the mill from a brushwood blaze on adjoining land. Mr. Harrison, the aged mill owner, hurried to the spot and frantically tried to prevent the flames spreading, but with a strong south-easterly breeze blowing it was only a matter of minutes before the fire had got a hold on the tarred brick and woodwork . . . the City Fire Brigade was telephoned for but before the Brigade arrived the superstucture crashed to the ground, a blazing tangle of burning beams. The crash was caused by the great head wheel with its solid iron shaft by which the sails were turned . . .
For the past five years the mill has not been in use, and its unique associations with the city had led to negotiations for its sale to a public trust for preservation as a memorial. A fund had been started to acquire the building . . . In an interview Mr. H. O. Clark, who is hon. secretary of the committee which was formed to acquire the mill . . . said the mill was built about 1780 . . . The committee of which Mr. Clark is hon. secretary was formed last October. 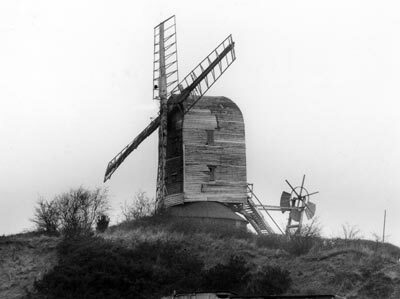 Numerous Norwich societies were represented on the committee and it was proposed to put the mill into repair and place it in the care of the Norfolk Archaeological Trust. An appeal for £300 was issued under the patronage of the Lord Lieutenant and the Lord Mayor . 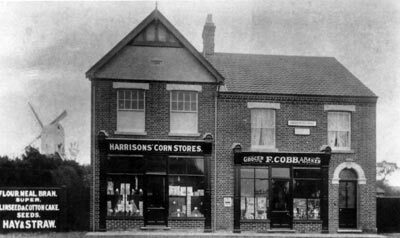 . .
Horace G. Harrison took the nearby “Brickmakers Arms” when he left the mill in 1928. After war service in the Royal Air Force he eventually retired to Shipdham, where he died on the 29th November 1976, aged 85. In 1974 Horace G. Harrison wrote to Harry Apling to say that there were a pair of 4 ft. 6 ins. and a pair of 4 ft. French burr stones in the head of the mill and also a single pair of 3 ft. 6 ins. the tail. However, he never used this smaller pair as they were too small to be economical. All the stones were underdriven from the great spur wheel. The tail stone nut was taken out of gear by removing a wooden cog segment of 4 or 5 teeth. In 1975 Horace G. Harrison wrote to Harry Apling to say that in his father's time, c.1900, he recalled that there was a 11 h.p. Crossley gas engine, running on town gas, in the granary driving a pair of peak stones. Presumably these were used for animal feed. Horace G. Harrison remembered the gale of about 1896 that rocked the mill. His father turned his back on it saying he didn't want to see her fall. 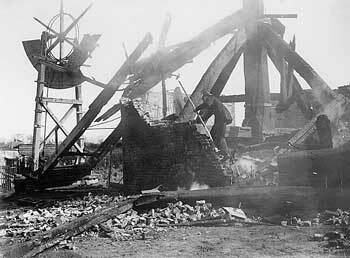 However, the mill survived. For about fifteen years, the late Mr. H. O. Clark worked on making an exact scale model of the mill at a scale of 1” to 1’, which is now in the Science Museum, London. 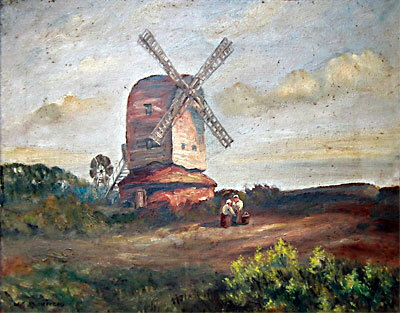 It had long been thought, and he was of the opinion, that this was the windmill depicted in John Crome’s painting of a windmill near Norwich, now in the Tate Gallery, London. However, consideration of other details in the picture, particularly the chalk pit in the foreground and comparison with similar pictures now supports the view that John Crome’s painting represents Trowse open trestle post mill. 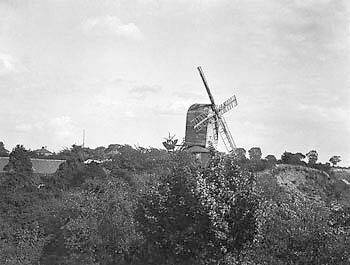 In fact, the frame of this picture is said to bear a label to the effect that it is Trowse postmill.
. . . Mousehold Heath, where stands . 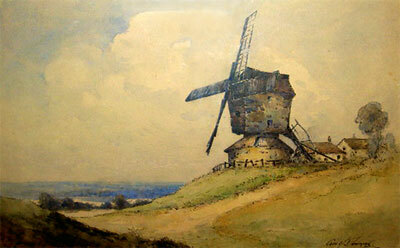 . . the subject of John Crome's picture "The Windmill". This is an eighteenth century post mill made of wood, with all the inside main beams of oak. It cost two thousand pounds to build and now after being derelict for two years, is in danger of being demolished or falling to bits . . . There was an attempt to preserve it for the nation, but it is now to be let. This mill, which has the usual revolving fantail fixed to the high steps which go round the roundhouse, is sometimes known as Sprowston Mill. 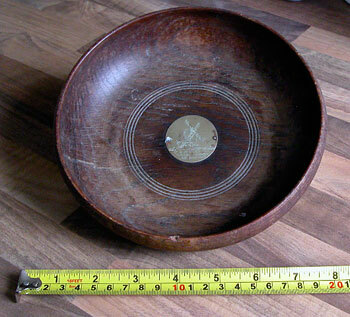 I have just inherited from my late mother a wooden bowl, about 18 cms. 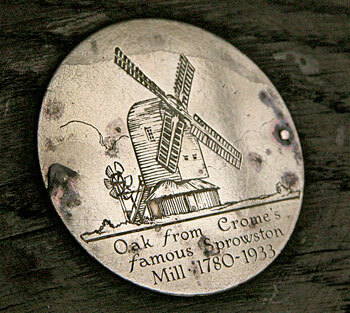 in diameter, and fitted with a small round brass plate bearing an engraving of the mill and inscribed "Oak from Crome's Sprowston Mill - 1780 -1933". I believe the bowl came from my mother's father, Mr. Sam Sleigh, a journalist on the East Anglian Daily Times, who acquired it soon after the mill's destruction. I have just visited your website, having been told of its existence by a newly found English distant cousin (a Robertson). 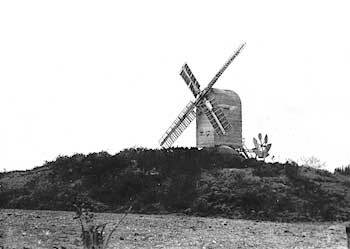 I was particularly interested in your section on Sprowston postmill as I am a granddaughter of the late Herbert Clifford Harrison who was born in the Mill House in 1888 and wrote two books about it. I have known about the mill all my life (my grandfather died in 1962 when I was 9, and his wife Nora and son Hubert (my father) both died in 1997, aged 99 and 75 respectively). I will be traveling to England in September so intend visiting the site of the Mill and Mill House (both now long gone of course). I was also interested in the last note added by Steve Wood a few weeks ago re the wooden bowl. I too have a wedge-shaped piece of oak from the mill with the same brass plate. I am not certain exactly what the item is (about 17cm by 11cm), but it was obviously meant to sit on a desk (its bottom surface is covered with green baize), perhaps as a paperweight, and has two nails protruding from the front, presumably to suspend a picture or small calendar or something. I think it's lovely that although the Mill itself has been lost long ago, small pieces of it remain scattered across the globe! Several years ago I was fitting central heating in my house and found that sometimes I could drill my wall to fix things to easily and then another time it was almost impossible to drill at all. I am talking way back some forty years ago, when electric drills did not have a hammer action to aid the drilling of hard material. Any way I mentioned this to a man who lived opposite to me in Russell Ave. Sprowston, and he said it was because my house was built using bricks recycled from the burnt out mill on the heath. To verify this I went into the roof space of my house and could see the mixture of assorted bricks. Some soft Norfolk reds and others very hard cream ones. 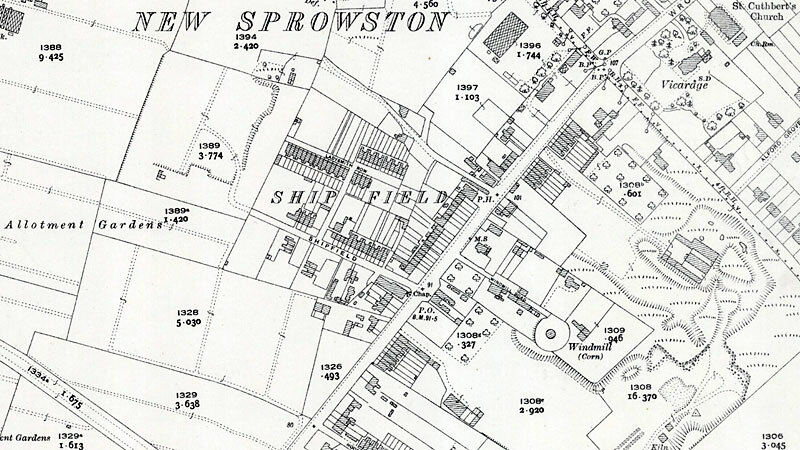 My Mum lived in Shipfield and can name all who lived on Sprowston Road. She is 97 and her grandfather was killed in Sprowston Mill Leo Lutkins . We have a photo of him. His widow Martha née Easton from Cawston had two children Maud and Leo with Leo and on his death went on to marry Herbert Bush and have two more children continuing to live in Sprowston. Mum lived at various addresses around Shipfield and on Sprowston Road until 1967 marrying my Dad who also lived in the area. 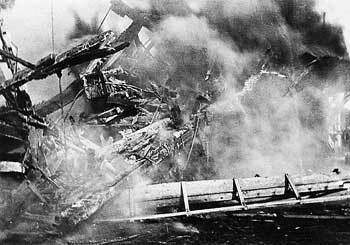 Mum has a fantastic memory and told me that she watched the mill burn down in 1933, she was 12 years old.